It’s only 25 days till Christmas and 111 days till Coney Island’s Opening Day on Palm Sunday, which is March 20 next year! Know somebody who can’t wait? Get ’em a Coney Island-themed gift that can be enjoyed year round. At the top of ATZ’s Coney Island gift guide is the sumptuous catalog ($50) for Coney Island: Visions of an American Dreamland. The traveling exhibit opened this month at the Brooklyn Museum and runs through March 13. Published by Yale Press, this beautifully designed art book — 304 pages, with 228 color plates and 77 b/w illustrations– is a pleasure to own, whether you live close enough to catch the show or not. Essays by exhibition curator Robin Jaffee Frank; John Kasson, whose book Amusing the Million inspired the title of this blog; film scholars Charles Musser and Josh Glick; and Coney Island History Project director Charles Denson on the future of Coney Island are illuminating. Enjoy Coney Island’s beach, boardwalk and amusement parks 365 days next year with John Huntington’s 2016 Coney Island calendar ($20). The Brooklyn-based photographer crowdsourced votes on his best shots and successfully raised $3,261 with 62 backers on Kickstarter to fund the project. Among our faves are Scream Zone’s gate on a snowy night (January), Wonder Wheel Park’s midway (July), and people watching fireworks on the beach (August). Visit John’s website to preview and buy the calendar or prints of the photos. Fans of Nathan’s, which is celebrating its 100th anniversary in 2016, will enjoy Lloyd Handwerker’s documentary about his grandfather, the founder of Nathan’s Famous hot dog empire. Recently released on DVD ($24.95), the documentary is told through home movies, archival photos and footage, the filmmaker’s interviews with a colorful cast of characters including family members and former Nathan’s workers, and the voice of Famous Nathan himself. As we wrote in a review when the film premiered at the Tribeca Film Festival, the cadence of Nathan’s voice and his story reverberate in the imagination even after the film is over: “I want to go to America. I was dreaming about it.” In addition to telling an insider’s history of this Coney Island institution, the film is a wonderful family memoir. Coney Island USA’s Sodom by the Sea Salon showcases the work of more than 75 artists, including painters Marc Kehoe, Eric March, Nancy Prusinowski, Chris Spinelli and Morgan Taylor; watercolorists Rose Nizami, Amanda Reilly, and Johanna Gargiulo Sherman; illustrator Sarah Beetson; and photographer members of the People’s Playground Paparazzi. The pieces range in price from $50 to $2,300, with the majority in the $200-$400 range. The free exhibit runs through February 7 at CIUSA’s Shooting Gallery/Arts Annex, 1214 Surf Avenue, and is open weekends, 1pm-4:30pm. Head next door or online to CIUSA’s gift shop for more art, as well as clothing, glassware and souvenirs. Lola Star’s souvenir boutiques in Coney Island have a satellite location at Rockaway Beach as well as an online store stocked with her unique designs. Coney-themed mugs graced with swimmers, lovebirds, anchors or sayings like “Everything I Know I Learned in Brooklyn” cost $10. Stocking stuffers include a Coney Island snowglobe ($8), an authentic Brooklyn hot dog onesie for the baby ($20), and Lola Star T-shirts galore for kids of all ages and adults ($20). 1205 Boardwalk West, 718-975-0583. From November through April, Coney Island’s beach belongs to the Polar Bears, but souvenirs of summer can still be found at Brooklyn Beach Shop on the Boardwalk. Warriors, mermaid, and various other Coney-themed tees come in an array of designs and colors. You can also find books such as Coney Island and Astroland by Charles Denson and Michael Stallings’ 500-piece jigsaw puzzle depicting summer at the amusement park. 1223 Boardwalk West, 718-676-0939. Williams Candy, Coney Island’s last remaining Mom and Pop candy shop since Philip’s lost their space in Stillwell Terminal, is owned by the Agrapides family and has been on Surf Avenue for over 75 years. 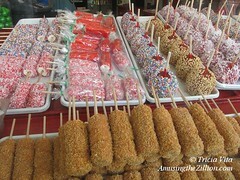 Their homemade marshmallow treats ($12 per dozen) and candy apples ($18 per dozen) are the quintessential Coney Island dessert after a hot dog at Nathan’s Famous, which is next door. While there is no mail order, Williams will cater your party and is open daily year round. Our favorites are their caramel marshmallow sticks with toasted coconut and chocolate caramel marshmallow sticks with chocolate sprinkles. 1318 Surf Avenue, 718-372-0302. Now that we’re past Black Friday and Small Biz Saturday, and Cyber Monday is nearly over, tomorrow is Giving Tuesday. A membership or donation to support one of Coney Island’s non-profit attractions — New York Aquarium, Coney Island History Project and Coney Island USA–is a gift that gives back all year long. Start off the New Year by joining the 112-year-old Coney Island Polar Bear Club’s January 1st Polar Bear Dip at 1pm. This hugely popular event is also a fundraiser for Camp Sunshine, where children with life-threatening illnesses and their families can enjoy a summer vacation. On New Year’s Day 2015, the Club raised more than $70K for the charity and they hope to meet or beat that amount in 2016. You and your friends can register online now and pledge a donation or help other participants meet their fundraising goals here. On the day of the event, the Polar Bears will also have a table on the boardwalk, where you can register for the Plunge and buy Polar Bear Hoodies and T-shirts. Great list – just bought a print from Philomania for my son.